23 Avondale Lawn is an attractive four bedroom semi-detached home built in the 60's. Positioned in a very quiet cul-de-sac development opposite a communal green this property is ideal for buyers seeking a peaceful family home in an excellent location. Accessed from Carysfort Avenue the area benefits from multiple primary and secondary schools within walking distance. This property benefits from complete privacy with the communal green to the front and rolling green playing fields to the rear. Internally the property has been very well maintained by the current owner. The accommodation which is approx. 139 sq.m includes; Entrance porch leading to the large entrance hall with under stair storage, kitchen/breakfast room and the bright living room and dining room off. The family room, the utility room and the guest wc are located off the kitchen. Upstairs there are four fine bedrooms and the upgraded shower room. 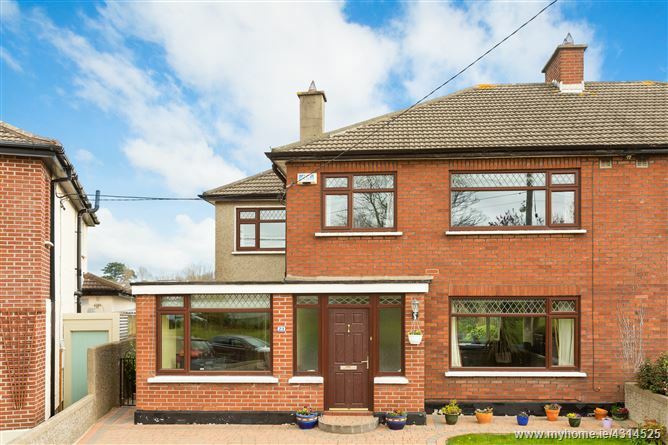 Avondale Lawn is a quiet mature residential area situated off Carysfort Avenue and is one of South Dublin's most desirable locations. An ideal home for any family with its close proximity to a selection of well-established schools; Carysfort National School, All Saints National School, St. Andrews College, Blackrock Colleges, Loreto Foxrock and Mount Anville to name a few. It is also within easy reach of UCD and walking distance from UCD Graduate Smurfit Business School. There are many leisure attractions nearby including Carysfort Park, Blackrock Park and the coastline. Blackrock Village is within walking distance and many other major shopping centres are also convenient such as Stillorgan and the Merrion Centre. Public transport is extremely well catered for with the Quality Bus Corridor (46a, 145 etc) and Blackrock DART station both within walking distance as well as the M50 and Luas only a short drive away making the commute to the city centre all the easier. Wide entrance hall with ceiling coving, under stair storage and accommodation off.